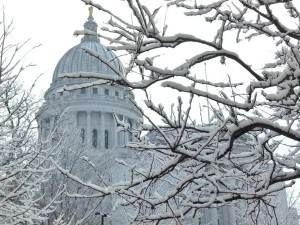 The deaths of at least six people in Wisconsin over the last week due to the cold weather is prompting a reminder about how to stay safe in the frigid temperatures. If you must go out in the cold, University of Wisconsin emergency room physician Brian Patterson says it’s important to take precautions and use common sense. That can include limiting your time outdoors in cold conditions and wearing warm clothing that covers as much skin as possible. “Skin coverage is important, and keeping your core body as warm as possible,” he says. In Dane County, three deaths over the holiday weekend are believed to be a result of exposure to the cold weather, along with two deaths in Milwaukee and one in Fond du Lac County. Patterson says people typically run into trouble when they don’t dress for the weather, thinking they will be outside for just a few minutes. However, if they run into car trouble or get locked outside, they can end up being exposed for much longer than planned. That can put them at risk for developing frostbite or hypothermia, which can be life threatening.